The Kiewit Corporation is a Fortune 500 contractor business headquartered in Omaha. It is an employee-owned privately held company, founded in 1884 as the Kiewit Brothers. In 1884, the brothers Peter and Andrew Kiewit, two bricklayers of Dutch descent, founded the company that would eventually become the Kiewit Corporation. For a large chunk of the 20th century, the company was headed by the founder’s youngest son – also named Peter Kiewit, and it was during his leadership that the business grew to become one of the world’s major construction companies. A lot of landmark infrastructure in the United States has been built by Kiewit, especially in the western states. The Flaming Gorge Dam in Utah, the Garrison Dam in North Dakota, the Montecillo Dam near Sacramento, and the 152-mile Friant-Kern Canal that brings water to California’s Central Valley are just a few examples. Many parts of the United States interstate highway system was also built by Kiewit, such as the Eisenhower Tunnel through the Colorado Rockies and the Fort McHenry Tunnel beneath Baltimore Harbor. Kiewit was also responsible for making the tricky sections of highway that runs through the Virgin River Canyon in Arizona and the Glenwood Canyon in Colorado. Throughout is life, Peter Kiewit the younger was very devoted to his hometown Omaha and did for instance purchase the the newspaper Omaha World-Herald in 1963 just to keep it locally owned. Before he died, Kiewit left instructions in his will to ensure that the paper would remain locally owned, with a large part of the plan securing employee ownership. Today, the Kiewit Corporation is one of the largest contractor companies in the world, and they have for instance build the world’s biggest geodesic dome for the Henry Doorly Zoo in Omaha. Their fields of expertise include construction, welding, mining, and off-shore operations. The Kiewit Corporation is subdivided into regional companies and divisions, that are then further divided into geographical districts. A lot of the administration is centralized to the corporate offices in Omaha. 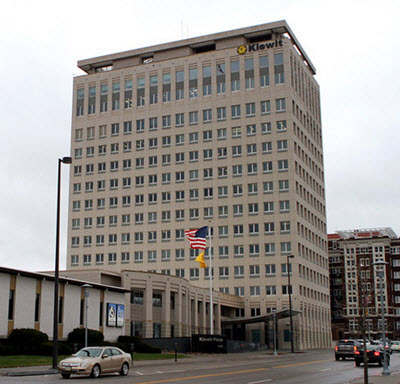 Kiewit Plaza is where you’ll find the headquarters for the Kiewit Corporation. It is a modernist-style high-rise office building, erected in 1960-1961 on 3555 Farnam Street, at the corner of S 36th street. In 1884, the brothers Peter and Andrew Kiewit formed a masonry partnership in Omaha and called it the Kiewit Brothers. They were the sons of a brick maker of Dutch descent who had moved to Omaha in the 1870s. 1889 is an important milestone in the early history of the Kiewit Brothers, since this is when they were contracted to build the 7-story Lincoln Hotel. At the turn of the century, the brothers ventured into general contracting, taking on responsibilities for the construction of the Bekins Warehouse. In 1904, the partnership was dissolved, and Peter Kiewit continued the businesses as sole proprietor. In 1912, the 23-year-old Ralph and 21-year-old George joined their father Peter Kiewit as partners in the business. Two years later, Peter Kiewit died, and Ralph took over the leadership. Back then, the youngest son – also named Peter – was only 14 years old. Another milestone was reached in 1924, as the now 40-year-old businesses landed its very first million-dollar contract: building the ten-story Livestock Exchange Building in the meat-packing district of South Omaha. By this point, Peter the younger had also become heavily involved in the firm, working as a project superintendent. 1924 was also the year when George left the firm, leaving it to his two brothers. After George’s departure, Peter took charge of the field operations while Ralph focused on supervising estimations and bidding activities. During the second half of the 1920s, the firm built several notable buildings, including the Nebraska State Capitol Tower in 1927, the Joslyn Art Museum in 1928 and the Union Station in 1929. For the Nebraska State Capital Tower project, Peter Kiewit recruited a man named Walter Scott, who would eventually turn out to be an very important man in the history of the business. In 1931, Ralph left Omaha for California. Peter dissolved the family business and replaced it with the company Peter Kiewit Sons’, Co. When Peter Kiewit the younger formed Peter Kiewit Sons’, assets valued at $125,000 were put into the company. To avoid cash-flow problems, and to the make the staff more motivated, Peter decided to let key managers buy shares in the new company if they wanted to. Peter remained majority shareholder and was also president of the company. Times weren’t easy for the new company, as the United States were going through the Great Depression and the house building sector was in a huge slump. Peter found a niche that could help them survive through the lean years: tax-funded highway construction projects. In order to carry it off, he assembled a core leadership group consisting of four men who all became directors and large shareholders of the company: Walter Scott, Homer Scott (not related to Walter), Ted Armstrong, and George Holling. Soon, Kiewit Sons’ were taking on highway projects not just in Nebraska but out of state as well, in places such as Colorado, Wyoming and North Dakota. In 1939, the company opened its first district office. It was located in Sheridan, Wyoming, and led by Homer Scott. Being agile and capable of changing with the times had become somewhat of a hallmark for the company, and in 1939 they complemented their highway business with a $7.5 million contract to build army barracks. The project wasn’t just the company’s biggest one so far – it also had to be completed in 90 days and the barracks were to be built in Fort Lewis, Washington, far away from Nebraska. As if this wasn’t enough, the army changed their plans when work on the barracks had just begun in – they wanted to increase the scope of the contract to more than twice as many buildings, from 760 to 1540, but without moving the deadline. Kiewit Sons’ agreed, and this became the start of a series of lucrative army contracts for the Omaha company. It also kicked the company’s geographical expansion into high gear, as the army needed facilities built from the Pacific Coast (including Alaska) through the Rocky Mountains states and into the Great Plains region. When the army needed something built rapidly and to standard, they knew they could count on Kiewit Sons’ to get the job done. Throughout WWII, the company created army bases, airfields and more. In their native Omaha, they built the impressive Martin Bomber Plant just south of the city. Before the war was over, Kiewit had done more than $500 million of military work. Instead of just being happy with the military construction contracts, Kiewit Sons’ broadened their scope and started getting involved in mining. It was an offshoot to their military ventures, since coal from the Big Horn Mine in Wyoming was needed at the Hanford Project in Washington State. This was were the top-secret Manhattan Project was carried out. With their previous experience from military work and dealing with the bitter Alaskan cold, Kiewit Sons’ was not a surprising choice when the U.S. Army needed to create a top-secret air base on Greenland in the early 1950s. To carry out the project, Kiewit had to hire and train 5,000 workers, and also handle perilous transports through icy waters. Kiewit Son’s didn’t leave Greenland until the second half of the 1960s. Not only did they create an airbase on Greenland, they also made the enormous radar screens required for the Ballistic Missile Early Warning System (BMEWS) and built radar domes on the ice cap for the eastern end of the Distant Early Warning (DEW) line. The $1.2 billion Gaseous Diffusion Plant Project at Portsmouth, Ohio was one of the biggest construction contracts ever awarded by the United States government. The plant was needed for the refinement of uranium for both military and civilian use. Who got the contract? Kiewit Sons’.